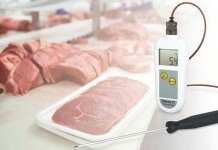 Advanced technology makes the new Thermapen 4 even more intuitive than previous models. The patented 360° self-rotating display automatically turns so the user can read the thermometer in any position – in either hand, left or right. The Thermapen 4 knows when it’s dark and turns on the backlight for you, making it easy to read in poorly lit areas or complete darkness. Alternatively, just touch the sensor window with your finger and the display lights up. 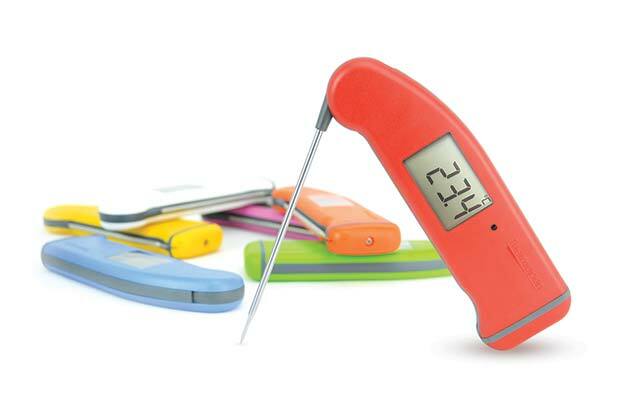 The Thermapen 4 is powered by a single AAA battery with a life expectancy of 3000 hours in normal use. Both low battery and open circuit (broken probe) are displayed, when applicable. The plastic casing is washable and includes ‘Biomaster’ additive that reduces bacterial growth. The ergonomic rubber seal minimises the risk of the ingress of water, dust or food. As well as being waterproof to IP66/67, it is still ‘probably’ the fastest reading contact thermometer on the market today. 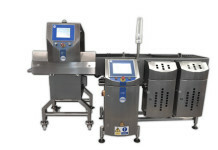 The true temperature of a product can be tested in just three seconds. The Thermapen 4 incorporates a reduced tip, stainless steel, penetration probe (Ø3.3 x 110 mm) that conveniently folds back through 180° into the side of the instrument when not in use.